Experience the efficiency and convenience of a truly mobile scanner! 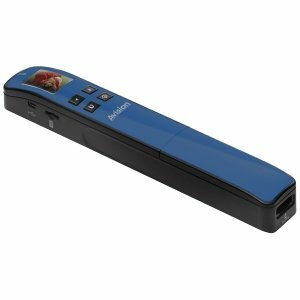 Powered only by 2x AA alkaline batteries, the MiWand 2 is a mobile scanner that allows you to scan without a computer or software. Simply gliding the scanner over the surface of a page and the scan is done. The images are then saved to a micro SD card up to 32G (optional). The brand new portable scanner can be operated with a single hand. Powered by alkaline batteries, you do not need to carry a heavy power adapter and hunt for an electric outlet anymore! Since no computer is required to start a scan, you can carry it to anywhere, anytime! Whenever on the road, in a plane, a car or a café, you can digitize almost everything right away! Whether standing or sitting, you can complete your scan by simply gliding it over a surface. The Preview feature allows you to view your JPEG image on the color LCD screen for 2 seconds immediately after a scan to confirm the images you have just captured. The innovative double roller technology delivers outstanding feeding reliability and image quality by significantly reducing the risk of skewing and distortion. If you have any questions about this product by Avision, contact us by completing and submitting the form below. If you are looking for a specif part number, please include it with your message.